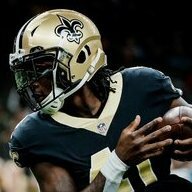 Lattimore wasn’t running at 100% on that cooks reception. We need pressure on Goff or we're done. The guy is clean, and we can't have that. 2 things. 1) he's far from Vaccarro. 2) Cooks is way faster no matter how you shake it. 1) Of course he is. And there's the difference maker. Game over. Literally just waved to the bartender that I need a check when I saw that. Like our Ravens game, I’ll check back in a few hours. They should have been ready for a fake. Prevent touchdowns at all costs, let them have FGs if we stop them. Refs are terrible. I know that benefits us, but that's still BS.